The latest mobile devices are offering more multimedia features, better communication capabilities (Bluetooth, Wi-Fi, GPRS/UMTS) and are more easily programmable than ever before. So far, those devices have been used mainly for communication, entertainment, and as electronic assistants. 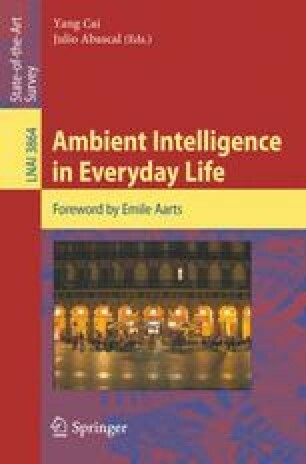 On the other hand, Ambient Intelligence (AmI) is emerging as a new research discipline merging the fields of Ubiquitous Computing and Communications, Context Awareness and Intelligent User Interfaces. The ultimate goal of AmI is to surround our working and living environments with context-aware, cooperative and invisible devices that will assist and help us in our everyday activities. Current mobile devices, which accompany us anywhere and at anytime, are the most convenient tools to help us benefit from AmI-enhanced environments. In other words, mobile devices are the best candidates to intermediate between us and our surroundings. In consequence, this paper proposes a middleware which aims to make this vision reality following a two-fold objective: (1) to simplify the creation and deployment of physical spaces hosting smart objects and (2) to transform mobile devices into universal remote controllers of those objects.